Until recently, Hadiza Hamza was one amongst millions of children not attending school in Northern Nigeria. Leaving in Malamawa community of Sokoto state with limited access to formal education, Hamza and her six siblings attended Qur’anic studies and helped their parents during the farming seasons. Now she sits at the back of a classroom in fourth grade at Malamawa Primary School pointing at words in a passage and reading aloud with other pupils. Last year, Hamza enrolled for a basic literacy program in community-based non-formal learning centers introduced by USAID’s Northern Education Initiative Plus. USAID’s Northern Education Initiative Plus is providing access to quality education and improving reading skills for more than two million school-aged children in formal and nontraditional schools. Through the project thus far, about 36,000 children who were out-of-school were enrolled in 800 learning centers spread across educationally disadvantaged communities in Bauchi and Sokoto states. 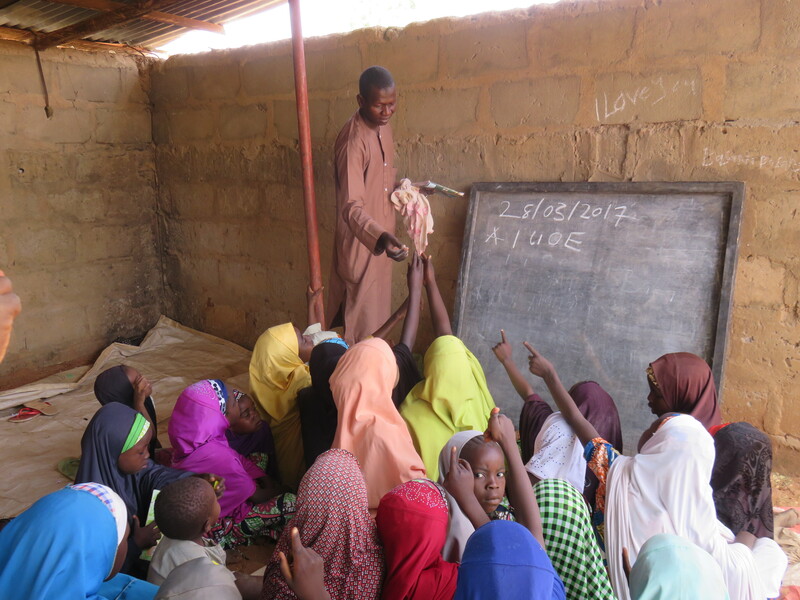 The project targeted children between ages 5-17 years, training educated community members as learning facilitators to teach literacy, numeracy and life skills in the Hausa language. During the six-month program, children like Hamza attended classes for a minimum of six hours every week and received textbooks developed by the project and other writing materials to aid their learning. When a center opened in her community, Hamza asked her father, who is an Islamic Cleric to enroll her. “I enjoyed attending classes. I loved my books. I liked the pictures especially the airplane. I know one day I will travel in it when I become a teacher,” she said. Hamza is making progress towards that dream. In March 2017, she wrote and passed an exit examination certifying she had completed the basic literacy program and also providing the opportunity to further her studies in fourth grade at a formal school. This exam was conducted by the regulatory body for non-formal education in Bauchi and Sokoto states, the State Agency for Mass Education. Almost 90 percent of 31,631 children tested on literacy, numeracy and life skills subjects taught during the basic literacy program passed and qualified to be mainstreamed into formal school. School authorities have been mobilized to accept these children in fourth grade when a new school year begins in September, 2017. But Hamza cannot wait. She convinced her parents to allow her start attending classes in fourth grade before she formally enrolls in the new school year. Her mother, Asmau, sees Hamza as a role model for the family. She is eager to support her daughter’s dream of furthering her education. “I am a very proud mother. Seeing how Hadiza can now read and write has made me realize the value of education,” she said. This website is made possible by the support of the American People through the United States Agency for International Development (USAID). The Northern Education Initiative Plus is funded by USAID under contract number AID-620-C-15-00002. The contents of this website are the sole responsibility of the Northern Education Initiative Plus. The information provided on this web site is not official U.S. Government information and does not represent the views or positions of the U.S. Agency for International Development or the U.S. Government.